Home / Blogging / Tricks / How to Create Auto Refresh Post in Blogger ? Are you looking for a method which can help you to create an Auto Refresh post on Blogger then you are at right place because here in this article today i am going to tell you about a method which can help you to create an Auto Refresh post on blogger or even you can make an Auto Refresh blog on blogger . I am going to tell you the simplest way with you can create an Auto Refresh post and if you want to know how to do it then keep reading this article because it will be so much important for you. How to Create Auto Refresh Post in Blogger ? Hey everyone, My name is Lokesh from Tech with Logic and here in this article i am going to tell you about How to Create Auto Refresh Post in Blogger and also an Auto Refresh Blog on Blogger. So, first of all, let's talk about why you need an Auto Refresh Post or Auto Refresh Blog so that everyone can relate to it. How to Make Blogger Permalink format Like WordPress ?? How to Check and Correct Grammar in any Article ? Why You should create an Auto Refresh post on Blogger? Guys, in today's time there are too many different-different ideas that can blow your mind up and creating an auto refresh post on blogger is also a different thing. This Auto Refresh system can help you to grow high pageviews on your blog or on your particular post. Those people who already know about HTML then they can easily do this thing but what about those who are normal Bloggers or those who are new in the field of Blogging and want to grow in it. Auto Refresh system help you to get higher views on your blog and you can also use this thing as other intentions like to Earn Higher coins on Mcent Browser and you can also use Auto Refresh on all those places where using of a website or app is Necessary for a long time. so, you can use it there and can grow faster or can get higher views on your blog or particular Blog post. 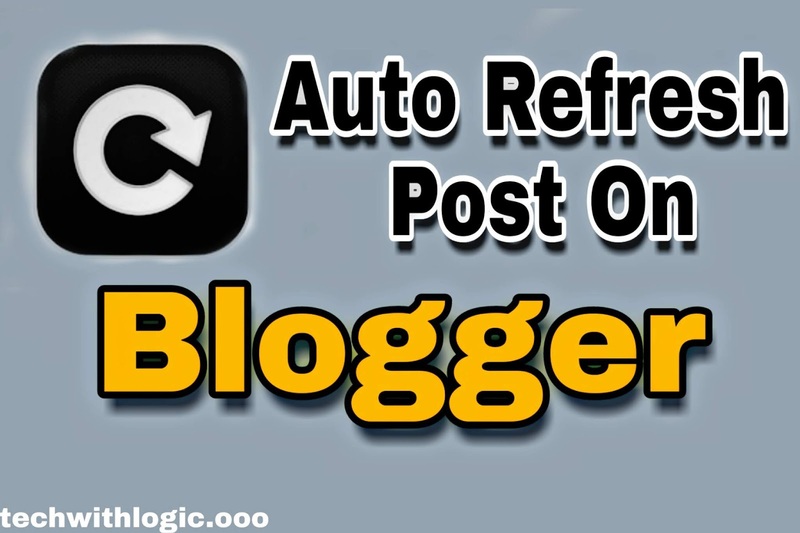 So, I hope you will understand why you need to create an auto refresh post or blog and now let's learn How to Create Auto Refresh Post in Blogger with the simplest method. How to Create Auto Refresh post or Blog on Blogger with a simple trick? Guys, here I am going to tell you a simple trick to Create Auto Refresh Post or Blog in Blogger and a new blogger also can use this. So, guys, I am going to tell you everything step by step and make sure you will follow all the steps. Guys, first of all, open your Blogger Dashboard and Create a New post and choose the HTML option instead of the to compose option in it. Now write your post as you want and design it as you want and then copy the below code and paste it there. here 120 are the seconds after that your post will be refreshed automatically you can set it as you want. Now publish your post and boom, from now your post will automatically refresh and you will get higher views on your blog post on low traffic. Now if you want to make your whole blog to refresh like this then go in the theme option and click on edit HTML and paste the code below <head>. Now you are done and your blog will be auto-refreshed. Guys here in this article i wrote about How to Create Auto Refresh Post in Blogger, even if you don't want to create it still you should learn it because maybe you will need it tomorrow. I hope you will like this article and if you do then don't forget to share it with your friends all over the world.